Can I feed my puppy adult food? Puppies and adult dogs have different calorie and nutritional requirements. Eating the wrong food for their developmental stage occasionally won’t harm your puppy, but regularly feeding your puppy adult food isn’t recommended. See our article on changing from puppy to adult food for more information on when to make the switch. How do I convert grams to ounces? Simply divide the grams figure by 28 to get ounces. For example 336g = 12oz. How can I get my puppy to switch to Pedigree® puppy food? 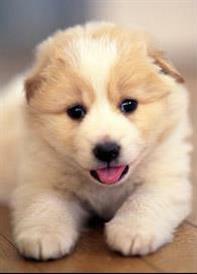 Any change to your puppy’s diet should be made slowly to avoid tummy upsets. Gradually introduce the new food over a 5-7 day period. Mix the new food into their diet by adding a spoonful at a time, and continue until the whole meal consists of the new food. My puppy isn’t eating very well – is there anything I can do to make the food more appealing? - mixing a small amount of Pedigree® Puppy Pouch or can into dry food. Can I soften Pedigree® Puppy Complete with water before feeding? You can moisten dry food by adding warm (but not boiling) water. Offer the food to your puppy when the meal has cooled and the food has soaked up the water. Encourage them to eat the food dry if you can because it’s good for your puppy’s teeth.